When the Egyptian government created a partial communications blackout on Thursday, shutting Internet and cell-phone service, it asked for the cooperation of foreign mobile phone companies. UK-based Vodafone complied, saying it had no choice but to cut service. In a statement issued Saturday, Vodafone said the Egyptian government would have been able to shut the network itself anyway, all within the bounds of Egyptian law. Mobinil, another major provider, which is owned in part by France Telecom, also complied. Did they have any choice? Vodafone may have been implying that Egypt would do just that if the company didn’t comply, saying a government shutdown would have meant a longer shutdown. Computerworld also reported that France Telecom withdrew about 20 foreign employees from the country. While governments have implemented partial shutdowns of telecommunications before, in Iran and China, the scale of Egypt’s actions are unprecedented, Wong said. And with activists increasingly organizing through texts and Twitter, she said, more countries are likely to do the same in the future. Multinational corporations may have little recourse when a government decides to shut down all service, but a number of companies, including Microsoft, Google and Yahoo! are trying to organize against such intrusions through the Global Network Initiative. The group, which includes advocacy organizations and investors as well, says increasing pressure from governments has led them to come up with a set of guiding principles to “protect and advance freedom of expression and privacy” in the telecom sector. It aims to help companies come up with a plan for how to deal with situations like what’s happening in Egypt before it occurs. 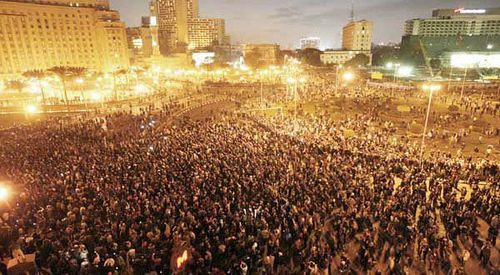 With interruptions of service in Egypt, it’s hard to tell how widespread and successful the crackdown has been. There was at least one report of BlackBerry users finding a way around the blocks. One Internet service provider reportedly held out for days before shutting down by Monday. And while cell service had supposedly resumed after the weekend, CNN reports the government has shut it again temporarily. It’s also unclear whether the Egyptian government had a legal basis for its actions, as Vodafone claimed. But Wong said that if even if there were some law that allowed the crackdown, it would run counter to international human-rights principles. Update: Egyptian internet and cell providers reportedly began restoring service Wednesday morning, at least in parts of the country. Is Apple Really Serious About Sustainability?